When the emergency has waned it is possible to start focusing on more sustainable long-term interventions that address VAWG within the security sector through security sector reform. Security sector reform (SSR) means transforming the security sector/system, “which includes all the actors, their roles, responsibilities and actions – working together to manage and operate the system in a manner that is more consistent with democratic norms and sound principles of good governance, and thus contributes to a well-functioning security framework” (OECD DAC, 2005 as cited by Valasek, 2008; also see Nill, 2011, and GTZ, 2007). Depending on the context, SSR can involve either the reform of existing security institutions or building entirely new security sector institutions. While SSR reform involves targeted activities focused specifically on the capacity of security actors, in post-conflict settings there are also other important opportunities to link SSR with related initiatives, including the negotiation and implementation of peace agreements; disarmament, demobilisation and reintegration (DDR); transitional justice and small arms control (Valasek, 2008). In addition, post-conflict environments can create important gateways for integrating women in security institutions and in security decision-making. National action plans on SCR 1325 also provide an opportunity to advocate for the inclusion of a clear mandate for the security sector to address violence against women with specific objectives and a strong monitoring and evaluation framework, including indicators to measure progress in SSR. Source: GTZ. 2007. 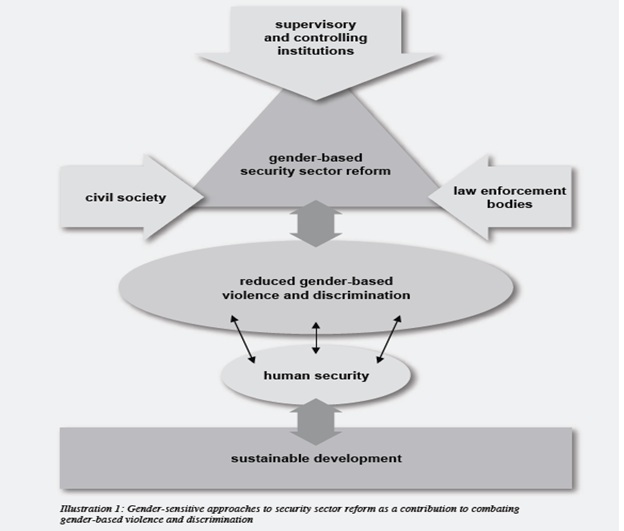 Security Sector Reform and Gender: Concept and Points of Entry for Development Cooperation. Developing institutional capacities of security institutions and competencies of personnel.